Here are some handy tips to remember when guiding your blindfolded Boss. When guiding, alert the person to potential hazards such as overhanging branches and surface changes. Avoid general words such as 'over there' and try to be specific such as 'directly on your right'. Remember to tell the person you are leaving when you go. Say your intention to offer assistance and then touch the back of your hand against the back of the person's hand you are about to guide. This is the signal for them to take your arm. 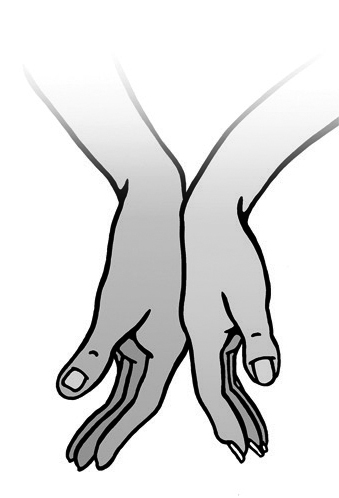 The blindfolded person will take hold of your arm just above the elbow with their four fingers on the inside and the thumb on the outside of your arm. Their grip should be firm, but not tight enough to cause discomfort. Keep your arm relaxed. 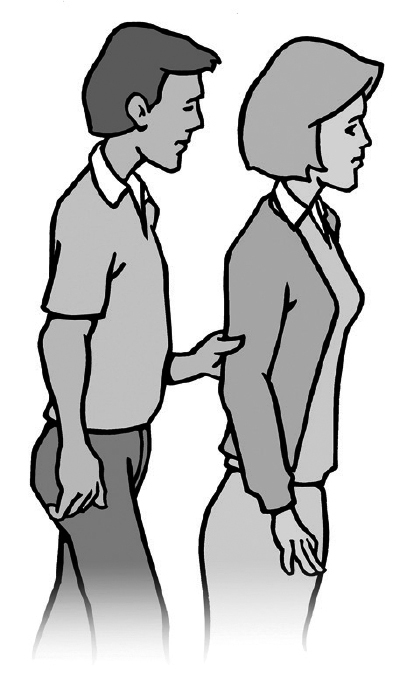 The arm of the person you are guiding should also be relaxed, bent at about 90 degrees and held closely to their side. They should walk beside you, about half a pace behind. The person you are guiding must be on the hinge side of the door. As you approach the door, say, "We are coming to a door. Ite opens towards (or away from) us and is hinged to the right (or left)." Take the handle in your free hand and open the door. Ask the person you are guiding to hold the door until you have passed through. They will then shut the door and release their hold from the handle. For doors opening away from you, the procedure is the same. When the door hinge is opposite to the person you are guiding, as them to change sides. 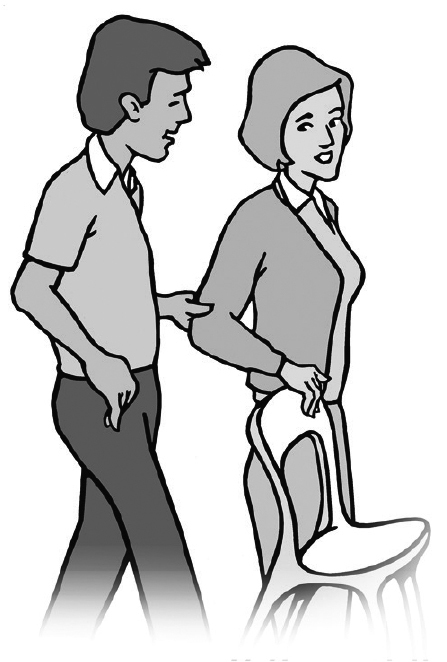 The guide places their own hand on the back of side of the chair. Mention the type of chair and which way it is facing. From here, the person guided will seat themselves. Tell the person you are guiding that you are approaching stairs and whether they are going up or down. Always approach stairs and kerbs directly in front and stop as you reach them. If the person you are guiding is not on the handrail side, tell them and let them change sides if they wish. As you step off, remain on one step ahead and then proceed together in rhythm. Pause when you reach the landing and indicate to the person you are guiding if there are any more steps to negotiate. For narrow aisles, doorways and other places where it is difficult to walk side by side, make a definite move with your arm backwards and across to the centre of your back. The person you are guiding should respond by straightening their arm and stepping directly behind you. Now you are in single file, one full pace apart. 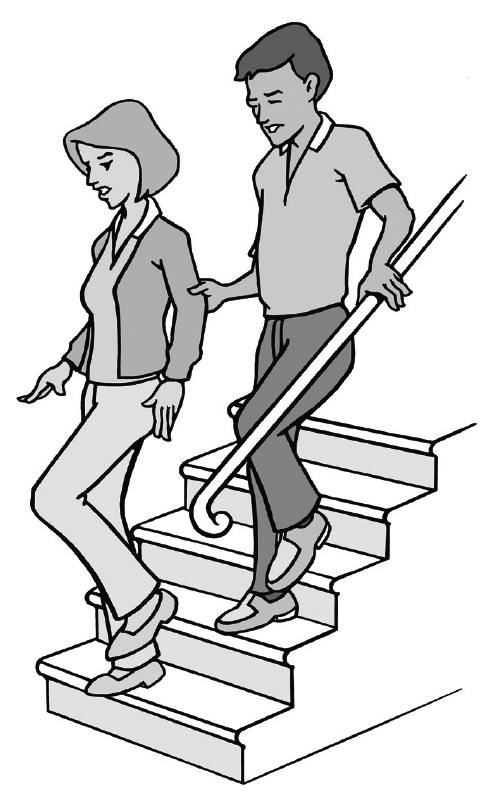 The arm of the person being guided must remain fully extended to prevent either of you from tripping over the other's feet. 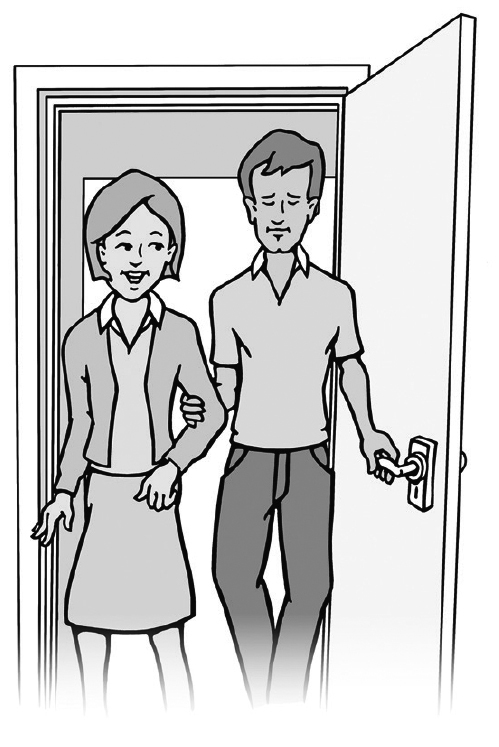 When you have passed through the narrow place, return your arm to its normal position by your side.